Immigration to Canada - AfriCanada.com WES Canada Questions & Answers - AfriCanada Consulting Inc.
1.1 WES Canada processing time. How long does it take WES to complete an evaluation? 1.2 How can I make changes to my order? 1.3 How much does a WES evaluation cost? 1.4 I forgot my reference number. Where can I find it? 1.5 What is included in a WES credential evaluation report? 1.6 What does the “Waiting for verification from institution” status mean? 1.7 How do I apply for a Canadian evaluation report? 1.8 What is my country of education? 1.9 What documents do I need to send to WES? 1.10 How do I apply for a WES evaluation? 1.11 What is a WES reference number? 1.12 Will WES evaluate all of my credentials? 1.13 How can I add another credential to my application? 1.14 How can I get a copy of my academic records from WES? 1.15 Do I have to send my documents again if I am ordering an upgrade of my evaluation report? 1.16 My name has changed. What should I do to change it on my WES account and evaluation report? 1.17 What can I do if I forgot my WES Login password? 1.18 I have only one name. How do I complete my application? 1.19 Which courier service should I use to send my documents to WES? 1.20 How long will WES keep my application on hold? 1.21 How can I add a recipient? 1.22 Do I need to send my secondary school documents if I also attended a university? 1.23 What is the timeframe to complete the evaluation when a verification request is sent to an institution? 1.24 How do I order additional or duplicate reports? 1.25 My institution or credential is not available for selection when using the WES Degree Equivalency Tool. How can I proceed? 1.26 Can WES request my documents from my institution? 1.27 Does my evaluation report expire after a certain period of time? 1.28 Does my WES Educational Credential Assessment (ECA) expire? 1.29 I previously received a WES evaluation report and would now like to apply for an Educational Credential Assessment (ECA) for immigration. What should I do? 1.30 Which evaluation package should I choose? 1.31 Do I need to contact my institution if I already have all my academic records with me? 1.32 My school may not have my transcripts because I graduated a long time ago. What should I do? 1.33 How do I change my order to a Course-by-Course evaluation? 1.34 What should I do if there is an error in the academic records I had sent to WES? 1.35 Why was my application canceled? 1.36 My date of birth is incorrect in my completed evaluation report. What should I do to change it? 1.37 Can I use my completed Canadian evaluation report in the United States? 1.38 Can I track my order without a tracking number? 1.39 I’m from Pakistan. How do I send my higher secondary school results? 1.40 My school may not have my transcripts because I graduated a long time ago. What should I do? 1.41 I studied at one school and completed the rest of my program at another school. What documents should I send? 1.42 Will professional licensing bodies accept a WES evaluation report? 1.43 How will I receive payment if my account shows I am owed a refund? 1.44 I’m from Pakistan. Will WES evaluate my Pakistan university? 1.45 Is there anything I can do to help move the verification process along more quickly? 1.46 What does the “Waiting for verification from institution” status mean? 1.47 My documents arrived at WES. Why has my status not been updated? 1.48 My file has been placed on hold for verification. What does this mean? 1.49 How to send transcripts. Can I use Digitary to send my academic records to WES? 1.50 Do I need to translate my documents? 1.51 Does WES offer translation services? 1.52 WES received your translations, but they are not precise, word-for-word translations and cannot be used to prepare your evaluation. 1.53 WES received your translations, but they are missing information and cannot be used to prepare your evaluation. 1.54 WES received your document, but it is not legible and cannot be used to prepare your evaluation. 1.55 Can I send my documents to WES before completing an application? 1.56 What should I do once I complete my WES application? 1.57 What should I do if there is an error in the academic records I had sent to WES? 1.58 How can I fix a mistake on my application? 1.59 Can I change my WES evaluation report from WES Basic to WES ICAP? 1.60 I selected the wrong evaluation type. How do I change my order? 1.61 What should I do if I have more credentials than I am able to enter in the online application? 1.62 What should I do if I am having problems paying by credit/debit card? 1.63 How do I cancel my application and get a refund? 1.64 Is there a cancellation fee? 1.65 What should I do if I accidentally paid for my evaluation twice? 1.66 Does the Canadian government evaluate foreign academic credentials? 1.67 What does an Educational Credential Assessment (ECA) package include? 1.68 How can I tell if I am eligible to apply for immigration to Canada under one of the Immigration, Refugees, and Citizenship Canada (IRCC) programs? 1.69 I previously received a WES evaluation report and would now like to apply for an Educational Credential Assessment (ECA) for immigration. What should I do? 1.70 How can I get an evaluation for the Ontario College Application Service (OCAS)? These FAQs answer most of the important WES Canada questions from WES Canada Login, to WES Canada forms, to WES Canada address, to WES Canada processing time, WES Canada fees, WES Canada contact and more. WES Canada processing time. How long does it take WES to complete an evaluation? An Educational Credential Assessment (ECA) for Immigration, Refugees, and Citizenship Canada (IRCC) takes about twenty (20) business days after we receive, review, and accept all your required documents and we receive payment in full. A Document-by-Document or Course-by-Course Evaluation takes about seven (7) business days after we receive, review, and accept all your required documents and we receive payment in full. Requests for other changes, such as adding or removing credentials, need to be made in writing using WES contact form. If your evaluation has been completed, it cannot be modified, but you can update your report. How much does a WES evaluation cost? I forgot my reference number. Where can I find it? You can view your reference number(s) after logging into My Account, and going to “Account Menu” > “Order History”. What is included in a WES credential evaluation report? Please visit WES Evaluations and Fees page for a full description of our evaluation reports. What does the “Waiting for verification from institution” status mean? This status means we have sent documents back to the institution for verification. Verification requests are mailed or emailed based on the verified contact information that is available to us. Please allow six weeks for your institution to respond. If your account status is still “Waiting for verification from institution” after six weeks, please contact customer service and ask for another verification request to be sent. How do I apply for a Canadian evaluation report? You may apply for one of our Canadian evaluation reports here. What is my country of education? Your country of education is generally the country where the institution that awarded/issued your degree is located. If your degree was awarded in another country and you are unsure which country to include on your application, please contact our Customer Service team. What documents do I need to send to WES? The list of required documents varies depending on the country where you studied. Please view the required documents for the country where you studied for detailed instructions. How do I apply for a WES evaluation? Simply complete a WES online application to get started. What is a WES reference number? You will receive a reference number after you have completed the online application. 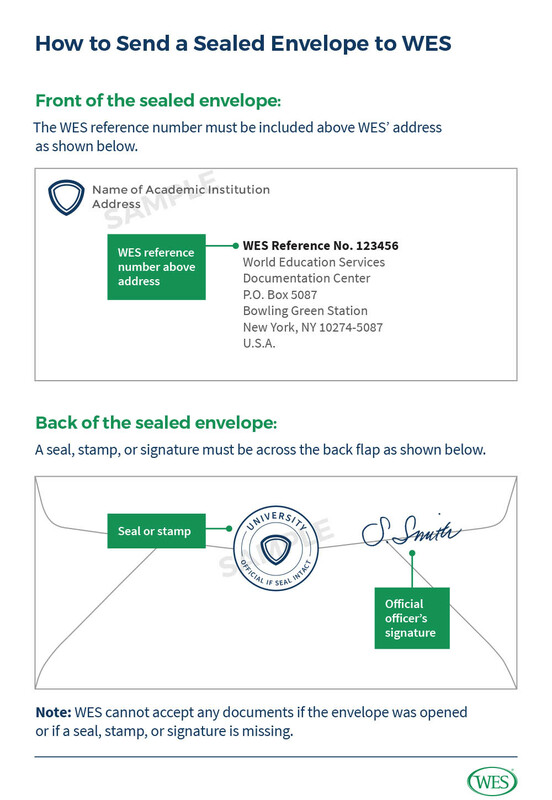 For prompt processing, please include your reference number on all envelopes and correspondence with WES. WES is not responsible for documents that arrive without a reference number. Will WES evaluate all of my credentials? WES evaluates formal academic credentials from institutions it considers to be recognized in other countries. We do not evaluate occupational study, trade qualifications, or short-term professional development programs. WES also reserves the right to not evaluate documents from certain institutions. How can I add another credential to my application? If your evaluation has been completed:You can add an additional credential by clicking “Update Report” in My Account. If your evaluation is in progress:Submit your request to customer service. How can I get a copy of my academic records from WES? Please contact your institution for a copy. WES does not provide copies of academic records to applicants. Do I have to send my documents again if I am ordering an upgrade of my evaluation report? No, the documents you used for your initial evaluation will be transferred to your upgraded application. If additional documents are required, you will be notified by email and on My Account.For more information on how to upgrade your evaluation report, you can watch this video. My name has changed. What should I do to change it on my WES account and evaluation report? Your name and date of birth cannot be edited after submitting an application. If your name has changed legally and needs to be changed on your evaluation report, please contact customer service. What can I do if I forgot my WES Login password? If you forgot your WES Login password, go to My Account and click the “Forgot password?” link under the “Password” field. I have only one name. How do I complete my application? If you have only one name, please enter a period (.) in either the first or last name field in the online application. Which courier service should I use to send my documents to WES? You may use any courier service you like to send your documents to WES. Shipping fees apply and should be paid directly to the courier service. How long will WES keep my application on hold? Files that are on hold remain on hold until all required documents, information, verification, and payment are received. Visit My Account to check the status of your application. If your evaluation is not completed, you may add a recipient by logging into My Account and clicking on “Modify My Order”. If your evaluation has been completed, you may add a recipient by logging into My Account and ordering a duplicate report under “Completed”. Do I need to send my secondary school documents if I also attended a university? If you have completed at least one year of post-secondary study, you typically do not need to submit your secondary (high school) documents unless the institution you are applying to requires it. Please review the required documents for the country where you studied for detailed instructions. What is the timeframe to complete the evaluation when a verification request is sent to an institution? Institutions can take from less than one week to over four weeks to respond to WES’ request for verification. You can always monitor the status of the verification in My Account. When documents have been sent for verification, the status for those documents under “My Documents” will indicate “Received Documents Awaiting Verification”. Once WES receives a response from the institution, the status will change to “Documents Received – Review in Progress”. After WES has reviewed and accepted the documents, the status will change to “Accepted”. WES will proceed with your evaluation once all the required documents for the credentials being evaluated have been received and accepted. How do I order additional or duplicate reports? For a completed evaluation: Sign in to My Account and order duplicate reports under Completed. For an in-progress evaluation:Sign in to My Account and click on Modify Order where you can add additional recipients to receive a copy of your completed report or order additional copies for yourself. For further instructions, please watch this video. Note: If your evaluation was completed before 1999, please complete this form to request an extra copy. My institution or credential is not available for selection when using the WES Degree Equivalency Tool. How can I proceed? Please manually enter your information in the relevant fields. WES will conduct any research needed. Does my evaluation report expire after a certain period of time? These evaluation reports have no expiration date. You can order duplicate copies of your evaluation report at any time in My Account. Your ECA evaluation report is valid for 5 years, but your academic records will be stored for 10 years. Does my WES Educational Credential Assessment (ECA) expire? Your WES Educational Credential Assessment (ECA) is valid for 5 years, but your academic records will be stored for 10 years. You can learn more about renewing your ECA report here. I previously received a WES evaluation report and would now like to apply for an Educational Credential Assessment (ECA) for immigration. What should I do? If you have previously received a WES evaluation report, please login to your WES account and order an additional copy for Immigration, Refugees and Citizenship Canada (IRCC) or to any Provincial Immigration Nominee Programs. Which evaluation package should I choose? If you are not ordering an evaluation for Immigration, Refugees and Citizenship Canada (IRCC), you should check with the institution(s) that will use your evaluation to make sure you order the evaluation package they need. Visit WES Evaluations and Fees page to compare costs and what each evaluation package includes. My school may not have my transcripts because I graduated a long time ago. What should I do? Most academic institutions maintain academic records indefinitely. Please contact your institution. If they no longer have your records, they will probably be able to tell you who to contact to obtain them. How do I change my order to a Course-by-Course evaluation? For an evaluation that is in-progress: Submit your request to customer service by using our contact form. Make sure to select “Change of Evaluation Type” as the category. For a completed evaluation: Log in to My Account and click on “Update Report.” Please note that additional fees apply. What should I do if there is an error in the academic records I had sent to WES? If there is an error in your academic records, please contact your institution and have the corrected version sent to WES as specified in our required documents. Why was my application canceled? If your application was cancelled, you will receive a letter of explanation. If you still have questions after receiving the letter, please use WES contact to contact WES. My date of birth is incorrect in my completed evaluation report. What should I do to change it? The date of birth on your evaluation report is based on the academic documents we received. If the date of birth is incorrect, please contact the institution and request that they correct your academic record. The updated academic documents must then be resubmitted according to our required documents. We will review the corrected academic record upon receipt and revise your evaluation report accordingly. Can I use my completed Canadian evaluation report in the United States? Submit a new online application for the U.S. Contact customer service using your Canadian reference number and request to have your documents transferred to your U.S. file. We will notify you by email if any additional documents are required. Can I track my order without a tracking number? No, tracking is unavailable with standard postal delivery. You can track your order only if you selected courier service. I studied at one school and completed the rest of my program at another school. What documents should I send? WES requires a complete record of study that led to the completion of a program. If your final institution lists all study, then you generally will only need to send documents from that institution. However, if it does not, please send documents from all other institutions you attended. Will professional licensing bodies accept a WES evaluation report? Many professional licensing bodies accept and require a WES evaluation report. For more information, please visit WES Advisor. Note: Professional licensing bodies beyond those listed on our website will also accept WES evaluations. We recommend that you contact the professional licensing body before submitting an application. How will I receive payment if my account shows I am owed a refund? You should receive your refund in the same manner that you made your payment. Please allow one week for credit/debit card refunds and four weeks for check or Western Union refunds. If for some reason WES is not able to issue a refund to your credit or debit card (such as an expired card), we will send you a check for the refund amount. I’m from Pakistan. Will WES evaluate my Pakistan university? We encourage you to create an account and start an application. The application typically sends an alert if you type the name of an institution whose credentials WES cannot evaluate. WES reserves the right to not evaluate documents from certain institutions depending on trends in document receipt, reliability, and verifiability. Is there anything I can do to help move the verification process along more quickly? Please allow up to four weeks for the verification to be received by WES. If your account status is still “Waiting for verification from institution” after four weeks, please contact us and we will issue a second verification request. Because the verification process is between your institution and WES, no action is required from you. My documents arrived at WES. Why has my status not been updated? It takes approximately three business days to process new documents once they arrive at WES. We will update the status of your application in My Account after each document is reviewed. My file has been placed on hold for verification. What does this mean? This means that WES has sent your academic documents back to the issuing institution for verification. The evaluation will proceed after WES receives a response from the institution. How to send transcripts. Can I use Digitary to send my academic records to WES? Go to your school’s website and follow the instructions for granting WES authorization to access your e-document online. Document access should be sent to the following email account: submit@wes.org. Note: Any correspondence or attachments are not accepted by submit@wes.org. All documents not issued in English must be translated. Precise, word-for-word English or French translations from your academic institution or a certified translation service. The translations must be in the exact order as they appear on the foreign language document. Please refer to the required documents for the country you studied in for detailed instructions. Certified translations do not need to be sent in a sealed envelope. You may send them to WES. Please send legible photocopies of word-for-word English translations for all foreign documents. Please do not send original translation documents as they cannot be returned. WES received your translations, but they are not precise, word-for-word translations and cannot be used to prepare your evaluation. If you received this status update via email, the translations we received do not correspond to the original language document(s). We cannot proceed unless the documents and translations match. Please send us a new set of translations that match the original language document(s). You may need to request new academic documents to ensure that the translator can provide an accurate translation. WES received your document, but it is not legible and cannot be used to prepare your evaluation. If you received this status update via email, it means that course titles, grades, name, date of birth, or other important details were not clearly printed and could not be read. We need all of these documents to be legible in order to conduct our analysis and produce an accurate evaluation. Can I send my documents to WES before completing an application? No, you should complete the online application first to receive a WES reference number. Include this number on all envelopes sent to us so that we can easily match your documents to your application. Note: Your evaluation will begin after we receive, review, and accept all required documents and payment. What should I do once I complete my WES application? Once you have completed your WES application, review our required documents and have your documents sent to us. You can check the status of documents sent to WES through My Account. Your account will be updated within three business days after WES receives your documents. How can I fix a mistake on my application? Please submit requests for any other changes to customer service and select “Other” as the question category. Can I change my WES evaluation report from WES Basic to WES ICAP? Yes, you can upgrade to the WES ICAP report if your transcripts were received by WES after January 1, 2007. To upgrade, visit My Account. I selected the wrong evaluation type. How do I change my order? To make a change to your evaluation package, please submit your request to WES customer service and select “Other” as the question category. What should I do if I have more credentials than I am able to enter in the online application? What should I do if I am having problems paying by credit/debit card? Check with your credit card company to see if your payment is in progress. Make sure you have entered the correct billing address. This is the address associated with your credit/debit card. Be certain that the card security code is correct (this is the three-digit number in the back of your card). If you are making a payment by credit or debit card from outside of the United States or Canada, we suggest notifying your credit/debit card issuer. Notifying them before the payment can limit the possibility of a declined transaction. How do I cancel my application and get a refund? To cancel an application, please submit your request to us by using our contact form. Note: Completed evaluations cannot be cancelled and fees cannot be refunded. Yes, there is a processing fee of $50 (Canadian dollars) for cancelling your application. What should I do if I accidentally paid for my evaluation twice? If you accidentally submitted payment to WES more than once using the same credit card, we will issue a refund for the duplicate payment(s). Please allow up to one week to receive your refund. Does the Canadian government evaluate foreign academic credentials? There is not a designated national government agency in Canada that evaluates foreign academic credentials. They are evaluated by universities, provincial government agencies, and private organizations such as WES. WES is recognized by the Government of Ontario and is designated by the Minister of Immigration, Refugees and Citizenship of Canada (IRCC) to provide Educational Credential Assessments (ECA) for academic credentials earned outside of Canada. How can I tell if I am eligible to apply for immigration to Canada under one of the Immigration, Refugees, and Citizenship Canada (IRCC) programs? WES cannot answer questions about immigration eligibility through Immigration, Refugees and Citizenship Canada (IRCC). Please visit their website or Help Centre for more information. How can I get an evaluation for the Ontario College Application Service (OCAS)? If you need to submit an evaluation to the Ontario College Application Service (OCAS), complete the WES application and select ontariocolleges.ca as the recipient of your evaluation. See also What is WES Canada?